In a food processor, pulse onion and garlic until pureed. In a large bowl, stir together onion puree, ground chicken, eggs, breadcrumbs, lemon (juice and zest), thyme, cinnamon, nutmeg, and salt. Mix together until well combined. Form into a large ball and place in a 4-quart crockpot which has been drizzled with olive oil. Cover and cook for 4-6 hours on high, or 6-8 hours on low. Unplug crockpot and remove lid 30 minutes before serving. This will allow the gyros to set and cut into nice slices. When ready to serve, remove meat from slow cooker. 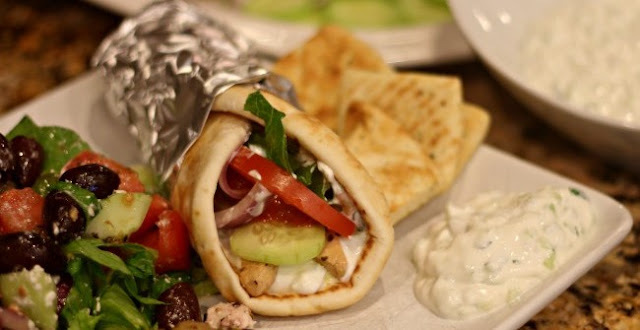 Slice and serve on warmed pita bread topped with tomatoes, cucumbers, yogurt, and fresh-squeezed lemon juice.